With their illuminating designs constructed from recycled materials, Luzinteruptus has always been a favorite here at Inhabitat. 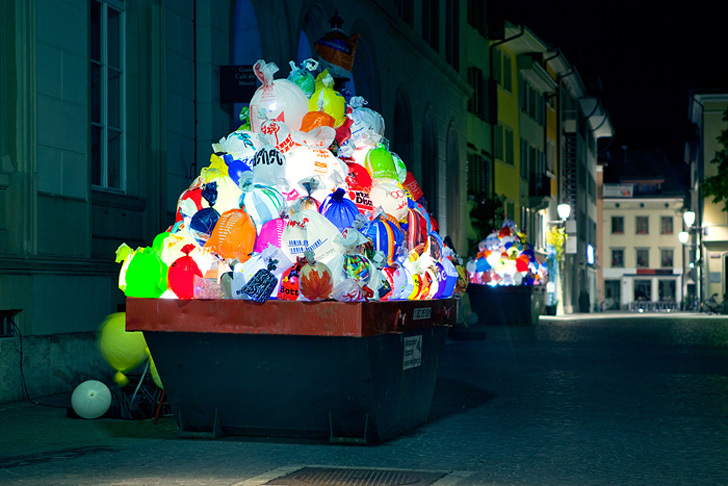 Their latest piece, 'Plastic garbage guarding the museum' is another spectacular concept that caught our eye with not only its otherworldly glow, but its ingenious use of discarded plastic bags arriving from shops all across Switzerland. The sculpture was designed for the Oh Plastiksack! exhibit at the Gewerbemuseum in Winthertur, Switzerland. Following Oh Plastiksack!‘s monographic theme of plastic bags, Luzinterruptus went about town collecting various bags from local residents. The museum even arranged for free admission to all their exhibits for anyone who would recycle a plastic bag with them. Luzinterruptus ended up with more than 5,000 plastic bags to use in their installation, and they opted to apply only the most striking and colorful bags. The bags were filled with air, stacked in two large containers, and lit from within before being placed in front of the museum. The installation is on a four month run (initiated in June) and its significance lies in how it will evolve with time and how the public will react. As Luzinteruptus relays: “The first few days of the installation were the most striking and spectacular, with all the bags perfectly placed and filled with air. After a few weeks the display was no longer as pleasing to the eye and surely after 4 months it will look truly decrepit. Oh Plastiksack! is curated by Susanna Kumschick and will be on display until October 7, 2012. Following Oh Plastiksack! 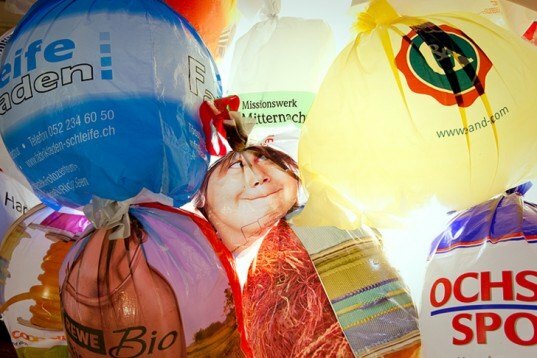 's monographic theme of plastic bags, Luzinteruptus went about town collecting various bags from local residents. The museum even arranged for free admission to all their exhibits to anyone who would recycle a plastic bag with them. The team ended up with more than 5,000 plastic bags to use in their installation, and they opted to apply the most striking and colorful bags. The bags were filled with air, stacked in two large containers, and lit from within before being placed in front of the museum. The installation is on a four month run (initiated in June) and its significance lies in how it will evolve with time and how the public will react. As Luzinteruptus relays: "The first few days of the installation were the most striking and spectacular, with all the bags perfectly placed and filled with air. After a few weeks the display was no longer as pleasing to the eye and surely after 4 months it will look truly decrepit. "This, far from worrying us, helps us to make sense of an installation which you can experience, in a visual manner, the reality of plastic bags, objects generally created with the purpose of inviting consumption and building an image that speaks positively about the brand, but that once used, if not carefully recycled, they become very damaging and impossible to remove from the environment." Visitors amongst bags placed in the courtyard on opening day. The installation 1 month later.